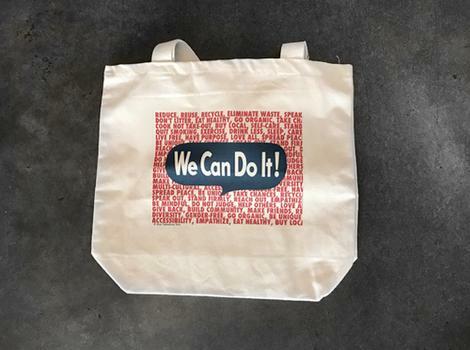 Rika Takashima's "We Can Do It! series is based on the American wartime propaganda poster produced by J. Howard Miller in 1943 for Westinghouse Electric as an inspirational image to boost worker morale. Featuring "Rosie the Riveter" the iconic figure of a strong female war production worker that was also used to promote feminism and other political issues beginning in the 1980s. Takashima uses Manga style and techniques to explore American history, the power of community activism and the importance of immigration to inspire future generations to continue socio-political resitence in the Trump-era. Rica Takashima was born and raised in Tokyo, Japan. Her questions towards traditional Japanese patriarchal family values and discrimination against LGBT motivated her to start drawing conceptual Manga for the public in 1995. Her Manga was published in English, Japanese, and Italian versions. She also developed participatory interactive street installation projects. After immigrating to the US with her family in 2008, she collaborated with diverse organizations. Rica participated in The Bronx Museum’s AIM program, FLOW15 outdoor art exhibition, Bronx Calling: The Third Biennial, and Boogie on the Boulevard.